July 17, 2017 – This week, the old-time machine leads a funeral procession, starting at George Washington’s crypt at Mount Vernon and ending over 200 years later paying out respects to Gerald R. Ford in Grand Rapids, Michigan. Returning for a second time-travel adventure is Louis Picone, author of: The President is Dead! 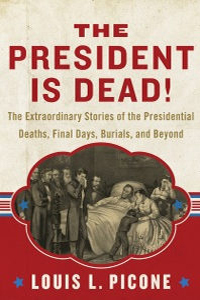 The Extraordinary Stories of the Presidential Deaths, Final Days, Burials, and Beyond . If love walking in the final steps or baby steps of our presidents, be sure to like Louis Picone at Facebook.com/LouisLPicone, where he actively shares his enthusiasm for the men who’ve served in America’s highest office.